when your friends leave, you throw them a party. we should throw them a party. there's been an extra amount of sugar and butter going on around me lately. i think i need some real food. just for now. i'll probably be back talking about cake and things tomorrow. but now, i want some plants. ahh tomatoes, one last good looking bag. for this party, the guests of honor should come in all forms, big and small. some roasted, some raw. arugula will surely be invited...arugula is edgy and badass. he'll definitely bring the booze and get the ladies. chickpeas and pine nuts will be there, they'll keep things interesting. lemon. hey, how ya doin? mint and basil. lookin' good. keeping the party fresh. slices of red onion. they can be the streakers. quinoa. keen-wah. keenan and kal. where the heck is kal? i wish he'd come to my party. it's fresh and light. it's cool and nutty. it wants you to want it. and so tomatoes, we must say goodbye. i have to make room for every kind of apple and my canned pumpkin hoarding problem. bye bye sweet tomato friends. i will miss thee. inspired by Ottolenghi's Tomato Party in Plenty. what a glorious book. preheat the oven to 325. slice three or four of the larger tomatoes into wedges. arrange those and the cherry tomatoes on a baking sheet. sprinkle with a pinch of brown sugar, coarse salt, and pepper. drizzle them with olive oil and a splash of balsamic vinegar and place into the oven. roast for 45 minutes to an hour. 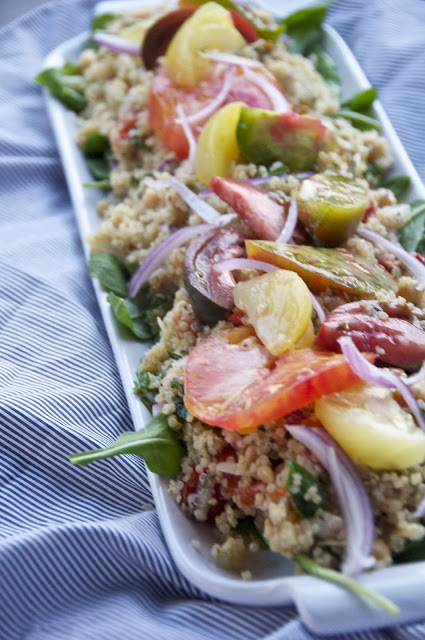 while the tomatoes roast, make the quinoa. 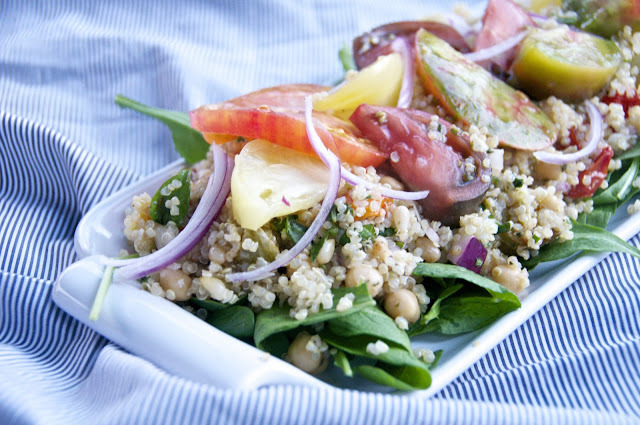 place the 2 cups of quinoa with 3 cups of water in a pan and bring to a boil. then reduce the heat and simmer for about 15 minutes until the quinoa is cooked and no water remains. let cool a bit. chop half of the onion very fine and the other half slice into thin strips. slice up the rest of the raw tomatoes in different shapes and sizes. 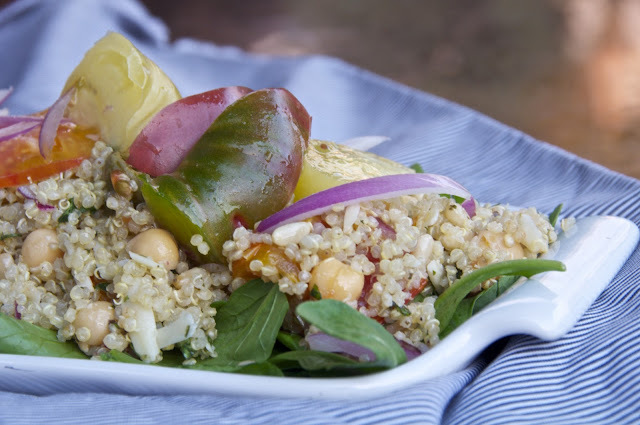 toss the quinoa with the garbanzos, pine nuts, finely diced onion, parmesan, lemon juice, garlic, herbs, a few glugs of olive oil, and all the roasted tomatoes and their juices. season well with salt and pepper. arrange arugula on a platter. top with quinoa mixture. 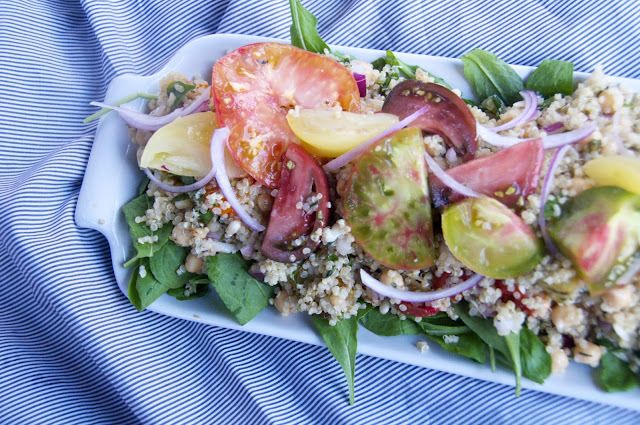 arrange the beautiful raw tomatoes on top and scatter with the sliced red onion. drizzle with a little more olive oil and sprinkle of sea salt. bon appetit. JuleYa--you are making me so hungry. Or should I call you JuleYum?